In the Wood River Valley, many show their patriotism come July 4 by frequenting the valley’s seasonal antique shows. There’s nothing like selecting a Civil War-era American flag to grace a home or reveling in the craftsmanship of Native American bone jewelry to remember the past and embrace the present. With four shows in the area this weekend, lovers of the antique and storied will have their choice of artifacts. Start at Roberta McKercher Park, where Alee Marsters is holding the 21st annual Hailey’s Antique Market on Friday and Saturday, July 4-5, from 9 a.m. to 6 p.m., and Sunday, July 6, from 9 a.m. to 4 p.m. Marsters, founder and promoter, said she’ll have between 60 and 70 antique and art dealers, along with some food and drink vendors. The event is held both in the Hailey National Armory and outside in the park. Marsters said to expect fine art, pedal cars, vintage advertising, Western folk art, cast-iron door stops, guns, estate jewelry and more. She said one vendor is coming from Florida with vintage fabrics and another from Montana with whimsical Mexican yard art. As far as trends go, Marsters said vintage gardening equipment should be a big seller this season. Down the road is Hailey’s Main Street Antique Show, scheduled for Friday, July 4, and Saturday, July 5, from 9 a.m. to 7 p.m., and Sunday, July 6, from 9 a.m. to 5 p.m. at 739 N. Main St., the vacant lot near McDonald’s. Promoter Dana Jo Cameron said industrial artwork is a “craze that’s going through” and we can expect to see pictures made out of canning jars and shelving made from old metal doors. Coming all the way from Texas is Sandy Schor and Co. with vintage beads and jewelry. “We don’t [normally] see what he brings out because it’s so unique,” Cameron said, citing Schor’s sterling silver chatelaines—metal clasps worn at the waist with dangling objects connected by chains that were signs of status among women in the 19th century. Before women carried purses, they often relied on chatelaines to keep an array of miniature accessories close at hand. Cameron expects around 40 vendors selling both distant and local goods. One female artist is selling barn paintings, some of which depict structures in the Wood River Valley that are threatened with demolition. 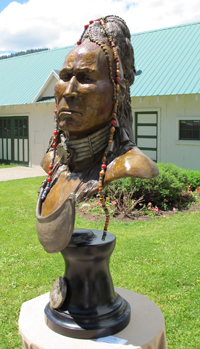 The Ketchum Art and Antique show, the oldest in the valley at 35 years running, will be at Ketchum’s Forest Service Park from 10 a.m. to 6 p.m. July 4-5, and 10 a.m. to 5 p.m. on July 6. Organizer Mary Nyholm-Vidano said Southwestern jewelry and Native American pieces are expected to be big-ticket items. Denver-based Big Blue Wreck Salvage will have a booth with sunken treasures that its diving team retrieved from worldwide expeditions. Vintage hunters can expect guns, three centuries’ worth of American flags, horse equipment and Native American artifacts. Art for sale will include custom knives, silver, oil paintings and jewelry. Given the holiday, Nyholm-Vidano said she senses that collectors will be eyeing the assortment of American flags. Prohorenko collects vintage paraphernalia from all over the country, but mainly from the Bay Area and Seattle. She’s been at it for 40 years, so she’s “hooked in” to dealers nationwide. While she saw a huge interest in rhinestone costume jewelry last year, this year she’s predicting an interest in the antique hair combs that she bought at an estate sale. She also has seen an interest in repurposed vintage creations, which her sales associate specializes in.